Abstract: Acute coronary syndrome in young people represents a risk condition expected to increase due to nowadays lifestyle. We report the case of a 29-year-old male patient admitted for non ST elevation myocardial infarction. Coronary angiography revealed a non-obstructive thrombus in the proximal segment of the left anterior descending coronary artery, with non-significant stenosis. A multimodality imaging approach was essential for an accurate diagnosis and risk stratificati-on. Intravascular imaging provided important insights regarding the mechanism of non-ST elevation myocardial infarction. Further clinical studies are needed to assess best medical treatment and imaging modalities in myocardial infarction with non-obstructive coronary arteries. Rezumat: Sindromul coronarian acut la vârstă tânără reprezintă o situaţie considerată a fi la risc crescut, a cărei incidenţă va creşte probabil în viitor datorită stilului de viaţă actual. Prezentăm cazul unui pacient în vârstă de 29 de ani, internat cu sindrom coronarian acut fără supradenivelare de segment ST. Angiografi a coronariană a evidenţiat un tromb non-obstructiv la nivelul segmentului proximal al arterei descendente anterioare, asociat cu stenoză nesemnificativă angiografi c. O abordare cu tehnici imagistice multiple a fost esenţială atât pentru un diagnostic corect, cât şi pentru stratificarea riscului. Tehnicile de imagistică intravasculară au contribuit la stabilirea mecanismului sindromului coronarian acut fără supradenivelare de segment ST. Sunt necesare studii suplimentare pentru a stabili tratamentul şi modalitatea imagistică adecvată la pacienţii cu afectare coronariană non-obstructivă. large number of cases the subsequent mechanism is not found even after extensive tests5. A 29-year-old county policeman presented to the emergency department complaining of two episodes of exertional chest pain, lasted for round five minutes each. He was a professional rugby player several years ago, currently practicing fitness, taking an oral protein nutrition supplement without steroids. He was a smo-ker, with positive heredity for coronary artery diseases (his father had a myocardial infarction before the age of 50-year-old). The patient was completely asympto-matic before this presentation and remembers having an electrocardiogram (ECG) with an abnormal aspect years ago, but no formal report was available. Clinical examination was unremarkable, blood pre-ssure was 130/80 mmHg, heart rate was 90 bpm, BMI 27 kg/m2. The ECG on admission showed negative T waves in leads III and avF and no other significant repolarization abnormalities were noted (Figure 1). The laboratory tests revealed an elevation of serum troponin I from 0.02ng/ml to 0.5ng/ml (normal value <0.02ng/ml), slight elevation of creatin kinase and cre-atin kinase myocardial band, without any inflammatory syndrome nor metabolic disorders. The blood gases were in the normal range and the D-dimer test was negative. The echocardiography was normal; no left ventricular wall motion abnormalities were noted. The coronary angiography performed in the first 24 hours of hospital admission revealed a proximal left anteri-or descending coronary artery (LAD) non-significant stenosis, before the take-off of the first diagonal bran-ch, with a most probably a non-obstructive thrombus (Figure 2). The right and circumfl ex coronary arteries were patent. The 24 hours ECG monitoring revealed numerous ventricular ectopic beats, with similar left bundle branch block morphology without any associ-ated symptoms, more pronounced after initiating the beta-blocker therapy. The patient was started on double antiplatelet therapy with Aspirin and Ticagrelor and unfractionated heparin anticoagulation. A beta-blocker and a high dose of statin was also added to the drug regimen. He was transferred in a University centre for coronary angiogram control, with possibility of intracoronary imaging. An optical coherence tomography examinati-on (OCT) was performed after fi ve days of antithrombotic therapy (Figure 3). A residual non-significant stenosis was noted within the mid left anterior des-cending coronary artery, without thrombus, without intimal tear or rupture, with only mild intimal irregula-rities. The clinical course was complicated by hepatic cytolysis due to high statin dose with complete resolu-tion after statin cessation. The patient was discharged on Aspirin 75mg od, Ticagrelor 90mg bid, Metoprolol succinate 50mg od, and Ezetimibe 10mg od. 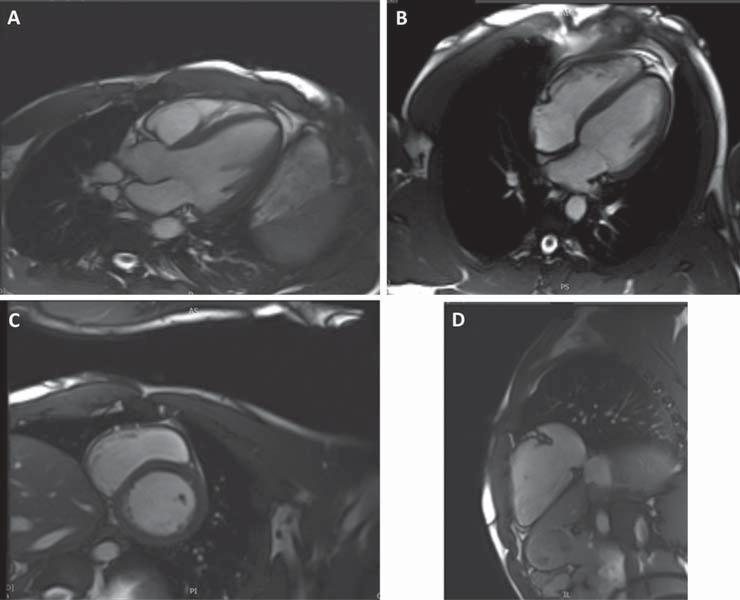 An ambulatory cardiac magnetic resonance (CMR) imaging was performed the fi rst week after his dis-charge, in order to better assess the myocardium (with a special regard to the right ventricle). There was no myocardial scar, nor right ventricular dysplasia, myocarditis or Takotsubo cardiomyopathy features (Figure 4). therapy the number of ventricular ectopic beats in-creased, with a value of 39 500 (34%) per 24 hours (Figure 5, 6). Asymptomatic episodes of non-sustained ventricular tachycardia were noted during the follow-up visits, with the same left bundle branch block QRS morphology. Arrhythmia improved on exertion and restarted in the recovery period of the ECG exerci-se test. Bradycardia was most probably the arrhyth-mia trigger. The beta-blocker treatment was ceased and the patient referred for ventricular mapping with a view to ablation therapy. Although the patient was asymptomatic during arrhythmic episodes, his job as a county policeman, with repeated medical visits and subsequent anxiety were the main arguments for re-ferral. A right ventricular septal ectopic pattern was described, with suspicion of a papillary muscle origin. It was decided to continue the medical therapy witho-ut ablation due to the increased risk of the procedure. After the electrophysiological study the patient was continued on anti-arrhythmic agent, the medication being well tolerated and the patient continued to be asymptomatic. Figure 1. Twelve lead ECG on admission showing normal sinus rhythm, with negative T wave in DIII, avF and isolated ventricular ectopic beats. Figure 2. Initial coronary angiogram, showing patent right and circumflex coronary arteries (A, B). Non -obstructive thrombus may be visualised on the proximal segment of the left anterior descending coronary artery in right anterior oblique caudal view (B, white arrow) and right anterior oblique cranial view (C, white arrow). Figure 3. Coronary angiogram performed 5 days later in right anterior oblique cranial view revealing complete resolution of the proximal left anterior descending coronary artery thrombus (A, black arrow). Optical coherence tomography of the proximal left anterior descending coronary artery (B) showing minor intimal irregularities without intimal tear or thrombus. Figure 4. Cardiac Magnetic Resonance Imaging with three chamber (A), four chamber (B) and short axis views showing normal left ventricular function, without late Gadolinium enhancement. The right ventricle view (D) with normal aspect, without scar or criteria for arrhythmogenic dysplasia. Figure 5. 24 hours ECG showing large number of ventricular ectopic beats and episodes on non-sustained ventricular tachycardia. Figure 6. Resting twelve lead ECG during follow up visits showing the persistence of the repolarisation abnormalities and ventricular ectopic beats with the same right side morphology. Myocardial infarction with non-obstructive coronary arteries (MINOCA) is a heterogeneous entity with a prevalence ranging between 1–14% of all patients with a clinical diagnosis of acute myocardial infarction6. It is associated with up to 5% risk of death or recur-rent myocardial infarction over 1 year and 25% risk for recurrence of angina . Even if MINOCA associates a better prognosis in terms of in-hospital and twel-ve months mortality than acute myocardial infarction with obstructive coronary artery disease, early cohort studies suggest that is not as benign as reported befo-re9,10. A systematic review published in 2015 reported a 12-month all-cause mortality risk of around 4.7%. The Korean Myocardial Infarction Registry evaluated 12-month all-cause mortality in 8510 myocardial in-farction patients, reporting a 3.1% mortality in MINO-CA patients11. Cardiac magnetic resonance imaging is an impor-tant tool in the diagnosis of these patients. Late gado-linium enhancement allows localization of the area of myocardial damage and provides insight into the un-derlying mechanisms7,12. This technique was useful in the evaluation of our patient, to exclude others di-seases as well as to evaluate the presence of a pos-sible myocardial scar. Intracoronary imaging with in-travascular ultrasound (IVUS) or optical coherence tomography (OCT) are also useful imaging techniques to assess atherosclerotic disease. Further research is needed to understand the potential benefi t of routine application of intracoronary imaging at the time of co-ronary catheterization in patients with MINOCA7,12,13. In stable coronary artery disease, OCT is unable to accurately predict physiology when compared with fractional flow reserve (FFR)14-16. In acute coronary syndrome OCT has unique features that favor its use. This procedure has 100% sensitivity (vs. 33% sensiti-vity of IVUS) in detecting intraluminal thrombus when compared with coronary angioscopy16,17. The high sensitivity of the method in detecting thrombus can fulfi ll angiographic limitations in differentiating throm-bus from calcium and others etiologies of ambiguous angiographic radiolucency16. Intravascular OCT is con-sidered the gold standard method for fibrous cap rup-ture detection16,17 for which it has twice the sensitivity of IVUS16,17. A great number of reports indicate the ability of the method in discriminating the underlying mechanism of the ACS18, which can directly impact on the management strategy16,19,20. The technique is also used for the detection of non-CAD-related ACS etiology such as spontaneous coronary artery dissection. In this particular clinical setting, OCT-derived infor-mation could defer unnecessary stenting. These cha-racteristics make it the ideal method for defi ning the etiology and anatomic location of the culprit vessel/ segment or ruling out ACS16. This technique helped us to understand the mecha-nism of the ACS, to better evaluate the residual non-significant stenosis, confirming the absence of throm-bus at this time, as well as absence of any intimal tear or rupture, showing only mild intimal irregularities. Thrombosis plays a major role in the pathogene-sis of MINOCA with plaque disruption21 and our case supports this hypothesis. Dual antiplatelet therapy is recommended for one year followed by lifetime sin-gle antiplatelet therapy for patients with suspected or confi rmed plaque disruption and MINOCA7,22,23. It is well known that disruption occurs on a background of non-obstructive CAD, statin therapy also being recommended even if only a minor degree of athe-rosclerosis is found. Unfortunately, our case didn’t to-lerate statin because of a significant hepatic cytolysis (even on small doses). It might also be useful to assess the role of long-term anticoagulation and further studies are needed to address this. Long-term administration of the oral direct factor X-a inhibitor Rivaroxaban demonstrated to reduce the expression of pro-inflammatory media-tors, enhances thickness of the protective fibrous caps and reduces presence of medial erosions and lateral xanthomas, thus promoting lesion stability in a mice model with advanced atherosclerotic disease24. The role of long-term administration of the oral direct factor X-a inhibitor appears to be promising also for atherothrombosis disease in MINOCA patients. The results from the SwedeHeart registry study (the Swedish Web-system for Enhancement and Develop-ment of Evidence-based care in Heart Disease Evaluated According to Recommended Therapy)25 indicated that long-term treatment with statins and renin-angioten-sin-aldosterone system blockers (perhaps due to the increase in bradykinin and its vascular benefits) in pati-ents with MINOCA may be more benefi cial than beta-blockers and dual antiplatelet therapy25. Regarding the ectopic activity, this might have been related to the acute coronary syndrome (with a mini-mal localized scar, not visualized by echocardiography or CMR) or to a pre-existent non-diagnosed ectopic arrhythmia. It is likely that the ECG abnormality noticed years before was this ectopic activity but no formal documentation was available. We consider in-teresting the discrepancy between the localization of the coronary stenosis/thrombus and the ECG abnor-malities in two different areas. This could be explained by a large LAD irrigating the postero-inferior part of the apex, but the level of the lesion before the take-off of the first diagonal branch should give another antero-lateral repolarisation abnormality. 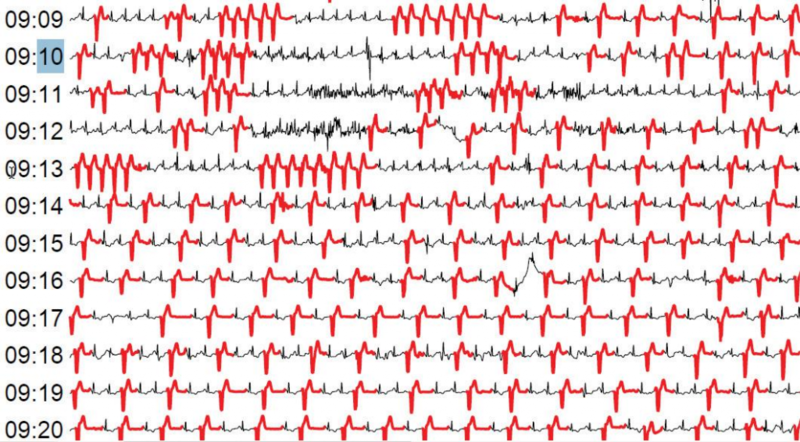 Taking into account the persistence of the negative T waves in the inferior leads during the follow up visits, we think that this might be a pattern present before the ACS, indu-ced by the pre-existent ectopic arrhythmia. In the present case, the oral nutrition supplement did not contain any steroid agent nor other com-ponent that might have been involved in coronary thrombosis or spasm. It only contained electrolytes and aminoacids which makes it unlikely for the supple-ment to be the cause of the acute coronary syndrome. The prognosis of this patient depends largely on secondary preventative measures such as smoking cessation and lifestyle improvement. The medical ma-nagement for MINOCA patients is still a matter of debate and future research is needed. This case suggests the importance of intravascular imaging at the time of coronary catheterization in MI-NOCA. Optical coherence tomography might help us understand the mechanisms, describe the lesions pro-perly and establish the correct management strategy in these cases. The on-site heart team is of crucial im-portance in the decision making process, using a com-prehensive approach and taking into account not only clinical data, but also social and personal data. Acknowledgments: This work was supported by the UMF Tirgu Mures research grant number 15609/ 9/29.12.2017. 1. Egred M, Viswanathan G, Davis GK. Myocardial infarction in young adults. Postgrad Med J 2005 (81): 741-5. 2. Ahmed E, El-Menyar A, Singh R, Al Binali HA, Al Suwaidi J. Effect of age on clinical presentation and outcome of patients hospitalized with acute coronary syndrome: a 20-year registry in a middle east-ern country. Open Cardiovasc Med J 2012; (6): 60-7. 3. Schoenenberger AW, Radovanovic D, Stauffer JC, Windecker S, Ur-ban P, Niedermaier G, Keller PF, Gutzwiller F, Erne P; AMIS Plus Investigators. Acute coronary syndromes in young patients: Presen-tation, treatment and outcome. Int J Cardiol 2011, (148): 300-4. 4. Esteban M, Sara M Montero, José J. A Sánchez, Horacio P. Hernán-dez, José J. G Pérez,Julio H Afonso, del C. R Pérez, Buenaventura B Díaz, Antonio C de León. Acute Coronary Syndrome in the Young: Clinical Characteristics, Risk Factors and Prognosis; The Open Car diovascular Medicine Journal, 2014 (8): 61-67. 5. Lopez Pais J., Izquierdo B., González V., Gorriz Magana J., Mata Ca-ballero R., Jesús Espinosa PascualM., Galán D., Martinez Peredo C.G., Awamleh P., Martin J.A. : Incidence, clinical profile and prog-nosis with Myocardial Infarction with Non Obstructive Coronary Arteries in the real world; JACC 2017, (69 Supl. 11). 6. Task Force on the management of ST-segment elevation acute myo-cardial infarction of the European Society of Cardiology (ESC), Steg PG, James SK, Atar D, Badano LP, Blomstrom-Lundqvist C, Borg-er MA, Di Mario C, Dickstein K, Ducrocq G, Fernandez-Aviles F, Gershlick AH, Giannuzzi P, Halvorsen S, Huber K, Juni P, Kastrati A, Knuuti J, Lenzen MJ, Mahaffey KW, Valgimigli M, van’t Hof A, Wi-dimsky P, Zahger D. ESC Guidelines for the management of acute myocardial infarction in patients presenting with ST-segment eleva-tion. Eur Heart J. 2012, (33): 2569–2619. 7. Agewall S, Beltrame JF, Reynolds HR, Niessner A, Rosano G, Alida L, Caforio P, De Caterina R, Zimarino M, Roffi M, Kjeldsen K, Atar D, Kaski JC, Sechtem U, Tornvall P. ESC Working Group Position Paper on Myocardial Infarction with Non-Obstructive Coronary Ar-teries (MINOCA). EHJ 2017, (38): 143-153. 8. Luscher T. Outcomes of acute coronary syndromes: clinical pre-sentation, gender, infl ammation, and cell therapy. EHJ 2017, (38): 125–129. 9. Bugiardini R, Bairey Merz CN. Angina with “normal” coronary arter-ies: a changing philosophy. JAMA 2005, (293), 477–484. 10. Giampaolo N., Giancarla S., Filippo C. Acute myocardial infarction with no obstructive coronary atherosclerosis: mechanisms and man-agement. European Heart Journal 2015, (36): 475–481. 11. Kang WY, Jeong MH, Ahn YK, Kim JH, Chae SC, Kim YJ, Hur SH, Seong IW, Hong TJ, Choi DH, Cho MC, Kim CJ, Seung, KB, Chung WS, Jang YS, Rha SW, Bae JH, Cho JG, Park SJ; Korea Acute Myocar-dial Infarction Registry Investigators. Are patients with angiographi-cally near-normal coronary arteries who present as acute myocar-dial infarction actually safe? Int J Cardiol. 2011, (146): 207–212. 12. Pasupathy S, Air T, Dreyer RP, Tavella R, Beltrame JF. Systematic Review of Patients Presenting with Suspected Myocardial Infarction and Non-Obstructive Coronary Arteries. Circulation. 2015, (131):861-870. 13. Kubo T, Imanishi T, Takarada S, Kuroi A, Ueno S, Yamano T, Tani-moto T, Matsuo Y, Masho T, Kitabata H, Tsuda K, Tomobuchi Y, Akasaka T. Assessment of culprit lesion morphology in acute myo-cardial infarction: ability of optical coherence tomography compared with intravascular ultrasound and coronary angioscopy. J Am Coll Cardiol 2007, (50): 933–939. 14. Nascimento BR, de Sousa MR, Koo BK. Diagnostic accuracy of intra-vascular ultrasound-derived minimal lumen area compared with frac-tional fl ow reserve–meta-analysis: pooled accuracy of IVUS luminal area versus FFR. Catheter Cardiovasc Interv2014;84 (377-85). 15. Stefano GT, Bezerra HG, Attizzani G. Utilization of frequency do-main optical coherence tomography and fractional flow reserve to assess intermediate coronary artery stenosis: conciliating anatomic and physiologic information. Int J Cardiovasc Imaging 2011;27 (299-308). 16. Bezerra H. Intravascular OCT in PCI. JACC 06/2016 (Expert Anali-sis). 17. Kubo T, Imanishi T, Takarada S, et al. Assessment of culprit lesion morphology in acute myocardial infarction: ability of optical coher-ence tomography compared with intravascular ultrasound and coro-nary angioscopy. J Am Coll Cardiol 2007;50 (933-9). 18. Guagliumi G, Capodanno D, Saia F, et al. Mechanisms of athero-thrombosis and vascular response to primary percutaneous coro-nary intervention in women versus men with acute myocardial in-farction: results of the OCTAVIA study. JACC Cardiovasc Interv 2014;7 (958-68). 19. Stefano GT, Bezerra HG, Mehanna E, et al. Unrestricted utilization of frequency domain optical coherence tomography in coronary in-terventions. Int J Cardiovasc Imaging2013;29 (741-52). 20. Wijns W, Shite J, Jones MR, et al. Optical coherence tomography im-aging during percutaneous coronary intervention impacts physician decision-making: ILUMIEN I study. Eur Heart J 2015;36 (3346-55). 21. Dan R, Petrescu L. Change of paradigm in pathogenesis of non-ST segment elevation myocardial infarction (NSTEMI). RRC 2016, (26 No 2): 121-127. 22. Lindahl B, Baron T, Erlinge D, Hadziosmanovic N, Nordenskjöld A, Gard A, Jernberg T., Medical Therapy for Secondary Prevention and Long-Term Outcome in Patients with Myocardial Infarction With Nonobstructive Coronary Arter Disease; Circulation 2018, (135): 1481-148. 23. Roffi M, Patrono C, Collet JP, Mueller C, Valgimigli M, Andreotti F, Bax JJ, Borger MA, Brotons C, Chew DP, Gencer B, Hasenfuss G, Kjeldsen K, Lancellotti P, Landmesser U, Mehilli J, Mukherjee D, Sto-rey RF, Windecker S. ESC Scientific Document Group: Task Force for the Management of Acute Coronary Syndromes in Patients Presenting without Persistent ST-Segment Elevation of the European Society of Cardiology (ESC). Eur Heart J 2016 (37): 267 –315. 24. Zhou Q, Bea F, Preusch M, Wang H, Isermann B, Shahzad K, Katus HA, Blessing E. Evaluation of Plaque Stability of Advanced Athero-sclerotic Lesions in Apo E-Defi cient Mice after Treatment with the Oral Factor Xa Inhibitor Rivaroxaban. Mediators Inflamm. 2011: 1-9. 25. Collste O, Sörensson P, Frick M, Agewall S, Daniel M, Henareh L, Ekenbäck C, Eurenius L, Guiron C, Jernberg T, Hofman- Bang C, Malmqvist K, Nagy E, Arheden H, Tornvall P. Myocardial infarction with normal coronary arteries is common and associated with nor-mal findings on cardiovascular magnetic resonance – results from the Stockholm myocardial infarction with normal coronaries study. J In-tern Med 2013; (273 no 2): 1365- 2796.